Nowhere more than in a bookstore is the message clearer: Americans will not forget Sept. 11, 2001. More than 100 books about terrorists, survivors, rescue workers and victims now dot the shelves of book stores everywhere. There are picture books, historical examinations and those that measure the cumulative impact on society and our world. All serve as reminders of what many carry every day – that lives have been altered forever. As the first anniversary of Sept. 11 approaches, we look back through the pages of a year marked with sadness and hope, heroism and loss. Vickie Hassenger, owner of Book People at Marketplace Shopping Centre, says she finds the 9-11 books a memorial to all involved. 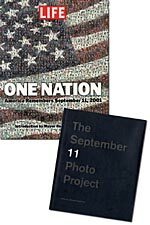 The photography book “One Nation” by Time-Life sold very well at Book People, as did other photo histories such as “The September 11 Photo Project” edited by Michael Feldschuh. One of Hassenger’s favorites is Andrews McMeel Publishing’s “September 11, 2001,” a collection of 150 headlines and front pages of major newspapers throughout the world. Yet how people choose to remember varies as much as the number of titles in print. One recent bestseller is “Let’s Roll” by Lisa Beamer, whose husband helped lead passengers in a confrontation with terrorists on United Flight 93. The book is selling well, Sullivan says, because people are interested in how others survived the event. Another book about Flight 93 – “Among the Heroes” by Jere Longman – also is selling well, according to Kate Smith, assistant manager at B. Dalton Booksellers in the Southern Hills Mall. “The ones that have sold the most are the ones that have the pictures with the newspaper clippings,” says Smith. All three bookstores have special displays now through the 9-11 anniversary, which feature children’s books as well as those for adults. The New York Times’ “A Nation Challenged,” gives a visual history of 9-11 and its aftermath, and also comes in both an adult and youth version. One of the most recent to hit stores is CBS News’ “What We Saw,” which comes with a DVD featuring news coverage of Sept. 11. Though their presence often reopens old wounds, booksellers agree that publishers have been judicious in preserving a segment in history. Hassenger says it is interesting to read about people’s perspectives along with those of the news media.